﻿Colorado Bend State Park offers adventure above and below the ground. ﻿With more than 30 miles of alluring trails, the ever-popular Gorman Falls and the inviting waters of the Colorado River at Colorado Bend State Park, you just might miss the intricate world beneath your feet. But a network of caves adds mystery and adventure to a park that’s known for its natural and unspoiled beauty. In fact, more than 400 caves have been discovered at Colorado Bend State Park, thanks to a partnership with the Texas Speleological Association. Wild cave tours led by park staff and volunteers offer visitors the chance to crawl and climb through a world of cave formations, hidden passages and underground ecosystems. Be prepared to get dirty and have fun! Boy Scout Troop 6187 from Frisco geared up and ventured into Turtle Shell Cave, led on their journey by park ranger Jason Hairston. 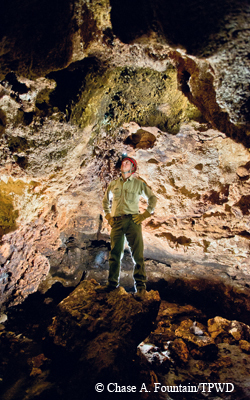 ﻿Colorado Bend has hundreds of caves, and a handful of them are open for guided tours. Ranger Jason Hairston leads groups to the underground world. A few of the boys had been in caves before, but it was the first time for many of them. As they clambered single-file through the tunnels, they learned how the cave was formed and how they can help protect it. While there are hundreds of caves in the park, only a handful are currently open for guided tours to ensure protection of these highly sensitive environments and to protect visitors. Caves and cave formations are nonrenewable natural resources, so stewardship is essential. After the scouts discovered the turtle-shaped rock, Hairston offered them a chance to venture into a 15-foot descent, aptly nicknamed the “esophagus.” Hairston clearly set expectations, and while the visitors were encouraged, none were forced to enter if they didn’t want to go. Hairston stood close by to offer assistance only if needed, and the scouts’ encouraging shouts of “C’mon, you can do it!” filled the air. After the boys took turns sliding and squirming through the tube, they emerged with smiles on their faces and victorious shouts. To learn more about wild cave tours and other programs available at Colorado Bend State Park, visit www.texasstateparks.org or call (325) 628-3240. From San Saba, take U.S. Highway 190 about four miles to FM 580 and follow the signs 13 miles to Bend; follow the signs four miles to the park entrance. The headquarters and main campgrounds are six miles past the entrance on the dirt road (unmarked County Road 442). Please note: There’s no gasoline service, so fill up before you arrive.